Well, here it is, warts and all. First off, in order to make the one charm pack stretch for three calendars, I added a few other fabrics. I couldn't find the felt by the bolt, so instead I used an ivory quilting fabric...and then had to add more to make it the right size. I struggled getting the fabric not to stretch in places. It did give me room to add the family name on the bottom, which I really like. In order to not go nuts, I decided to bind the calendar like a quilt to not fight the stretchiness. I also attempted machine quilting the backing fabric to the warm and natural batting before I sewed on the pockets. So, it's a little bunchy in places, but over all, the effect is pleasing, and I'm happy with the results. I used 12 of my favorite ideas for gratitude from A Bushel and a Peck of FUN, adding my own activities to tailor these to my family's needs, and also added a scripture for each topic. If any of you are interested, I'd be willing to post my version to Scribe ID. I cut each out theme and backed it on some cute scrapbooking paper to give it some weight, ideally these will be reused. 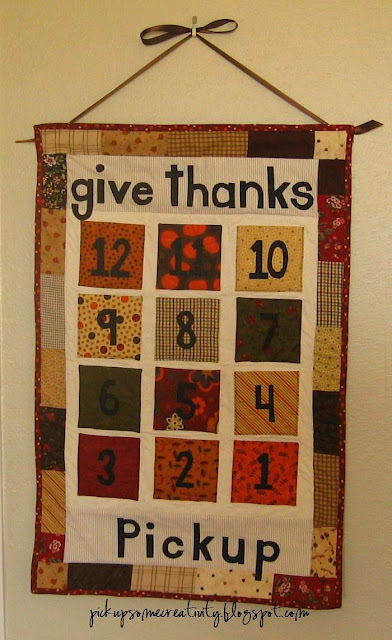 We'll be starting our countdown to Thanksgiving on November 14. I'm excited to have a means to focus my kidlets on what is important this month. It looks great! Congrats on finishing! What a great decoration for Thanksgiving!